Bali Traditional Tour Pemaksan Baroung Dengjalan from famous stone carving village 'Batur Brang'. They perform Barong dance Everyday at Temple Desa in Ubud. 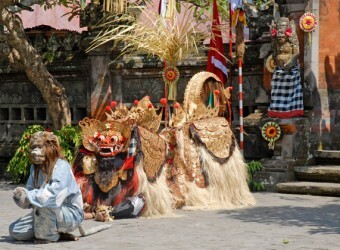 Barong dance is made story by Balinese mythology,　a lion like character fighting between good and evil. High speed rhythm and dynamic sound is high light. All Barong dancers wore masks on this stage performance, so it was like not really people who performed the dance, very exciting. I watched this dance show in the morning, and I think it would be more exciting if the show performed at night.